This event was a winter in the making. We wanted to start this year’s series of Third Thursday events in April, but winterish weather and renovations didn’t cooperate. May, however, did not disappoint. Gorgeous weather plus a 95% completed front room meant that it was time to call the taco truck and get this party started. The reason we put on Third Thursdays in the first place to is throw a regular get-together for our fellow mellow lovers of snarly two-wheelers. We feel really fortunate to be plugged into a diverse community of riders who love the same weird cross-section of motorcycles, scooters and mopeds that we do. This is a crowd of enthusiasts, which we appreciate as it cuts down on the d-bag factor. It’s a groovy, diverse group. and that diversity is evident every time we throw a Third Thursday. This month was no exception. Bikes started rolling in around 5:00, not long after the taco truck arrived (those are seriously good tacos, by the way). The trickle turned to a pour and soon our little lot on Prior Ave was brimming with bikes of all sorts. 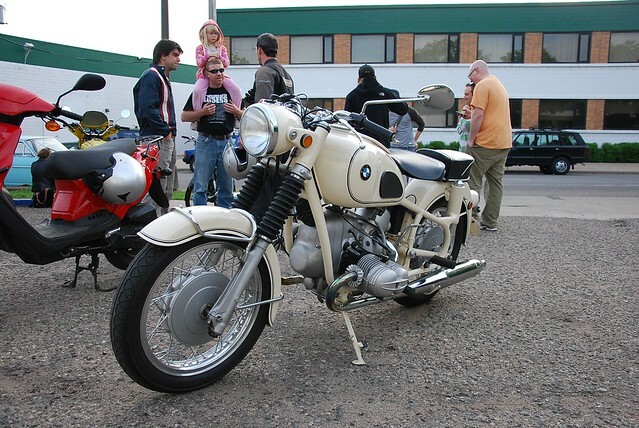 Cafes, bobbers, vintage japanese iron, old british stuff, hot rodded mopeds, a handful of Harleys and even a couple of modern twist-and-go scooters were lined up and intermingled. 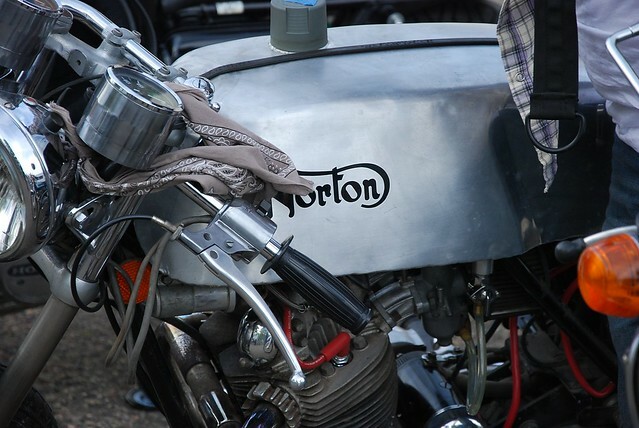 There were pristine, show-quality custom bikes, bare metal and gaffer tape rats, and loads of just everyday machines — each interesting in its own way. 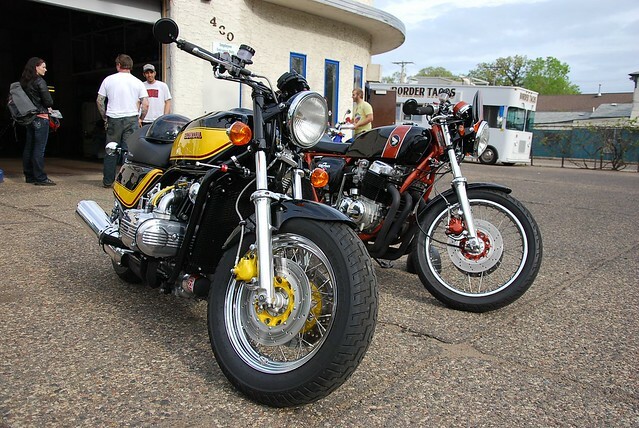 I was particularly captivated by a custom Honda GL1000 that rolled in just after 6:00. I’ve got a naked GL project of my own, and I’d seen this bike before at The Bearded Lady Motorcycle Freak Show last year. So getting to chat with the owner was a real treat. He was gracious enough to let me take a quick seat on his machine and get a feel for his handlebar geometry. I’ve got lots of ideas brewing now. 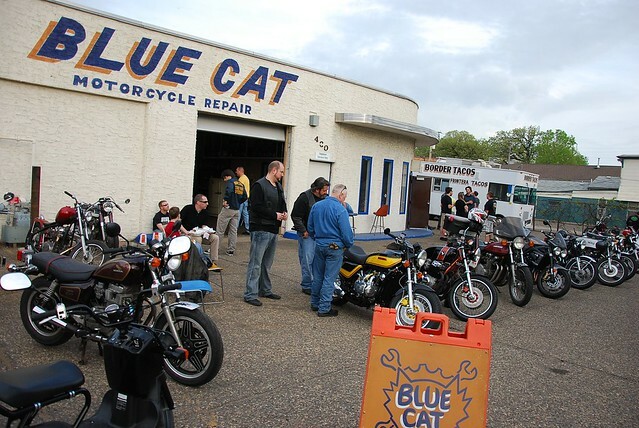 Counting mine in the back of the shop, there were four Honda GL Standards (“naked” Goldwings without any full fairings or luggage) at BlueCat that night and that’s got to be some kind of record. Unfortunately, I couldn’t stay for the whole evening’s comings and goings. I had to get home to record a podcast. But what I felt in that crowd of bikes and riders more than anything was a sense of relief. Finally, it was spring. Finally, we could get out and ride our machines. Finally, we could get together and hang out with each other. The rumble of engines echoed through our little St. Paul neighborhood. The smell of exhaust hung in the air — the sweet perfume of horsepower. 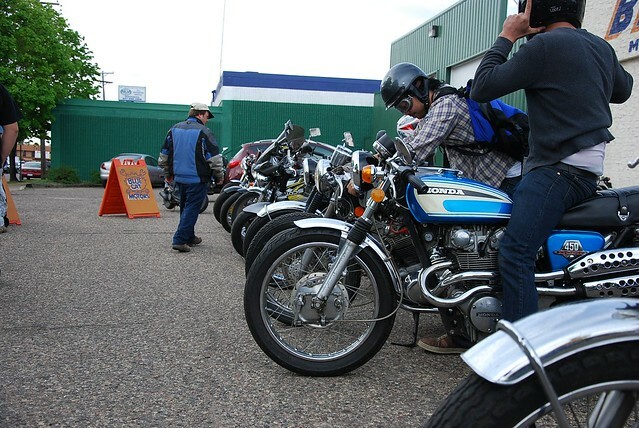 But best of all, the community of riders and gear heads that we love to serve had swung by to hang out. That makes Third Thursday a success in my book, and I for one can’t wait for next month.